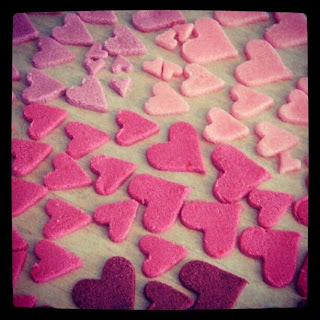 Inspired by a recent inquiry into wedding chalkboard cookies, I decided to make some Valentine Chalkboard Cookies! This is my small test batch, but I'm sure I will be making more in February. I also had a ton of sugar hearts (idea from Wedding Chicks pin) which I intend to use on cupcakes and such, but 2 cups of sugar makes a lot! I added a few to the cookies here and there. If you don't like to do a lot of piping/frosting, these cookies are for you! You can do them with as little as one color icing (borders are optional.) I painted the lettering on with a small brush and white food coloring. It does take a little patience and getting the right consistency on the food coloring can be tricky, but the effect is well worth the effort. 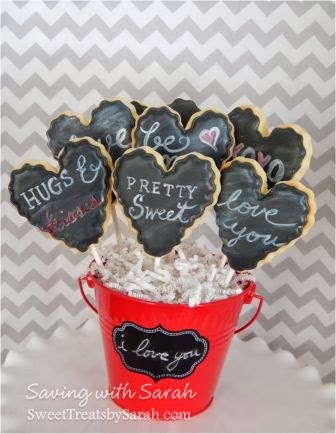 My 2015 Valentine Cookie Pops Post is up! Check it out here. Those are really awesome! I think I'll make some for Valentine's Day. Thanks for sharing. Ok I love those! How did you do them? Thank you! I painted them with white food coloring. Tiny prints featured a photo of your cookies on their Instagram account (without giving you credit.) I tried to tag you but I couldn't find you on IG. Thank you for letting me know. If I can find the IG post, I will contact them directly.